The land formerly owned by Orrin Best. 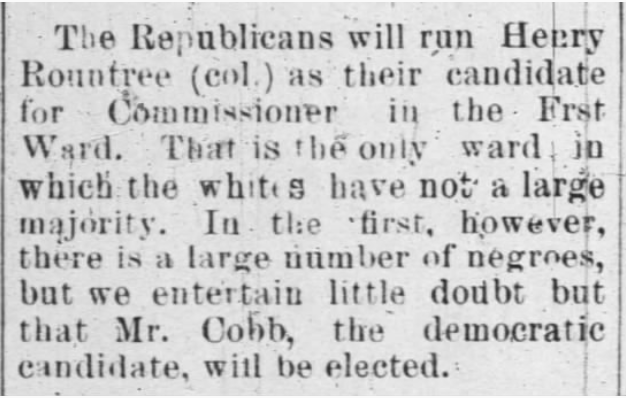 Wilson Daily Times, 5 October 1928. 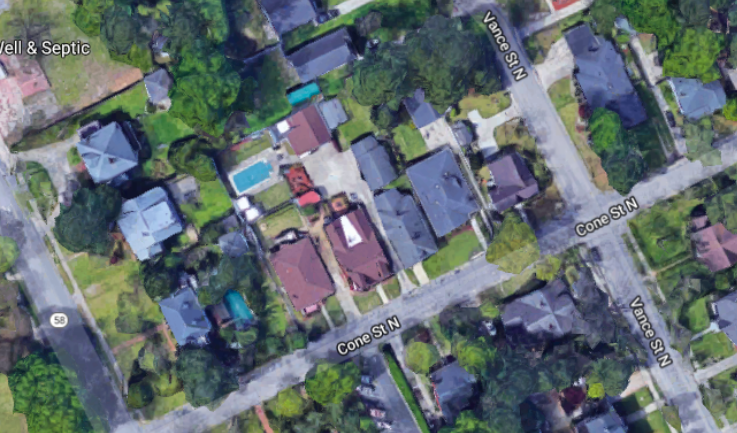 Here is the current landscape, showing that five houses sit on the 11 platted lots facing Cone between West Nash and West Vance. Lots 12 and 13 (and a sliver of 11) are now 111 Cone Street North, a four-bedroom Colonial Revival cottage built circa 1928. Photos courtesy of Google Maps. 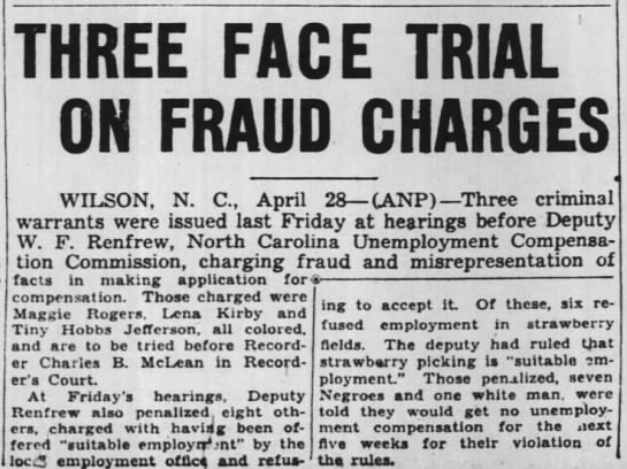 On 30 April 1938, the Pittsburgh Courier reported that three African-American Wilson women were facing fraud and misrepresentation charges connected with unemployment compensation applications. Though the details of their alleged crimes are not listed, the article notes that several others had recently been penalized after refusing employment in strawberry fields. Pittsburgh Courier, 30 April 1938. Maggie Rogers — in the 1940 census of Wilson, Wilson County: perhaps, at 705 Dew Street, high school lunchroom cook Maggie Rogers, 40, and her sons Phillip Henry, 18, a tobacco factory laborer, Millard Jr., 16, and Coach V., 14. Tiny Hobbs Jefferson — in the 1940 census of Wilson, Wilson County: fertilizer plant laborer Tom Jefferson, 43; wife Tiny, 32; and children George, 12, Lena, 10, Tom Jr., 4, and Momynise, 2. Bud Wright was convicted in Philadelphia, Pennsylvania, of “assault and battery to kill” in February 1921 and sentenced to five to seven years. Per his prison record, he was born in Wilson on 26 February 1892; worked as a laborer; was illiterate, having dropped out of third grade at age 12; left home at age 12; occasionally drank to excess; was married with no children; had 26 cents in cash, one pocketbook, and four keys; and his wife Rosie Wright lived at 732 Siegel Street, Philadelphia. William Hall was convicted of second degree murder and sentenced 25 June 1924 in Philadelphia to six to twelve years. Per his prison record, he was born 4 September 1894 in Wilson; had a patch of white hair (a birthmark) above his left eyebrow; worked as a bell boy; left home at age 14; was Baptist; was unmarried; had two shirts and two sleeve buttons; and his sister Ella Wilcher lived at 2424 Oxford Street, Philadelphia. Hall’s record included a card recording his Bertillon measurements, an early system of criminal identification. James Former, alias James Henry Forman, was convicted of larceny and sentenced 11 October 1919 in Lackawanna County, Pennsylvania, to one to three years. Per his prison record, he was born 8 May 1895 in Wilson; occasionally drank too much; worked as a bell boy; left school at age 12 and left home at age 18; was married with no children; had one money belt; and his mother Anna Forman lived at 205 Spruce Street, Wilson. Samuel Ennis was convicted of assault and battery and aggravated assault and battery and sentenced 2 October 1928 in Philadelphia to two to four years. Per his prison record, he was born 10 March 1890 in Wilson; worked as a laborer; completed the fourth grade; left home at age 15; was Baptist; was unmarried; had 15 cents, one carfare carrier and one key on a ring; and his sister Gertrude Brodie lived at 802 Green Street, Wilson. Gertrude Ennis, 18, of Wilson, daughter of Tom and Mariah Ennis, married George Broddie, 21, son of Thornton and Lizzie Brodie, on 15 February 1903 in Wilson. Missionary Baptist minister Fred M. Davis performed the ceremony at Ed McCullers‘ residence in the presence of Ellen Brodie, Ione Holden and Eddie McCullers. Pennsylvania, Prison, Reformatory, and Workhouse Records, 1829-1971, http://www.ancestry.com. 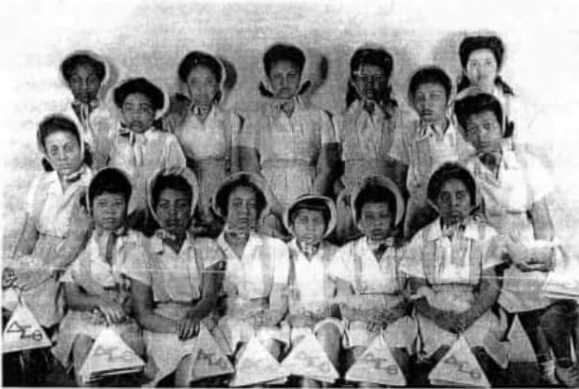 Seventy-four years ago today, Willa B. Jones Turner was initiated into the Alpha Mu chapter of Delta Sigma Theta Sorority on the campus of North Carolina State A.&T. University. She is third from left on the top row here. Congratulations, Soror Turner! Photo courtesy of S.M. Stevens. We don’t doubt he’ll lose. Wilson Advance, 28 April 1887. Henry C. Rountree was a prosperous butcher and grocer. A.V.C. Hunt in good times. In January 1898, grocer Annie V.C. Hunt bought a sorrel mare from horse dealers Selby & Hare for $110 (which seems a very high price.) The parties registered the note in Wilson County Superior Court. Disaster struck both parties ten months later when a fire started in Hunt’s store and swept through her Goldsboro Street block, destroying Selby & Hare’s stables. Coincidentally, both businesses rented their premises from Jefferson D. Farrior, and his suspicions about the source of the conflagration led to the slaughter of Hunt’s husband. Wilson Advance, 17 November 1898. Deed Book 46, page 128, Register of Deeds Office, Wilson. Though there is only one individual headstone, this family plot in Rest Haven cemetery likely holds the remains of several members of the John Adam Wilson and Mollie Newsome Wilson family. On 13 July 1893, Adam Wilson, 26, married Mollie Newsome, 19, in Wayne County. In the 1910 census of Nahunta township, Wayne County: farmer Adam Wilson, 44; wife Mollie, 36; and children Lenna, 15, Nina, 14, Adam J., 12, Zilpha A., 10, Sarah P., 8, Bunna, 6, Hurman, 4, William H., 2, and James J., 8 months. Fredrick Odel Wilson died 19 May 1918 in Wilson. Per his death certificate, he was born 16 December 1916 in Wilson County to Adam Wilson and Mollie Newsome, both born in Wayne County. He died of ileocolitis, and Mollie Wilson was informant. John Adam Wilson registered for the World War II draft in Newport News, Virginia, in 1918. 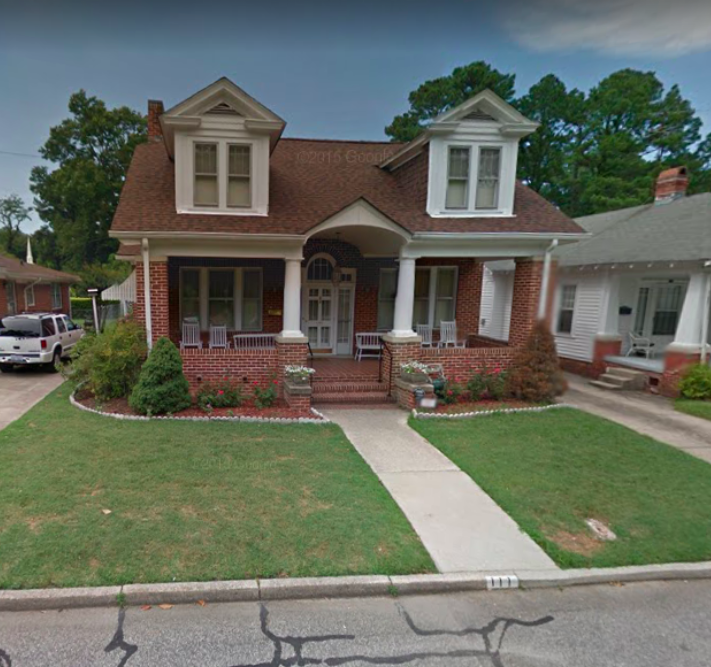 Per his registration card, he was born 25 February 1899; resided at 2131-22nd Street, Newport News; worked as a carpenter for Boyle-Robertson Construction Company; and his nearest Relative was Mollie Wilson of Wilson, North Carolina. In the 1920 census of Wilson, Wilson County: at 302 Vick, Mollie Wilson, 46; son Lennie, 25, house carpenter; daughter-in-law Georgia, 23; grandson Lennie Jr., 2; and children John A., 22, house carpenter; Annie D., 19, Sarah, 17, Bunyon, 16, Hirmon, 14, William H., 12, James J., 10, and Ire, 7. In the 1930 census of Newark, Essex County, New Jersey: at 10 Burnett Street, apartment janitor Leonard Wilson, 34; wife Georgia, 33; brother Herman, 21, lather; and children Leonard Jr., 11, Elma, 10, Ernest, 8, and Toney Lee, 6. All were born in North Carolina. 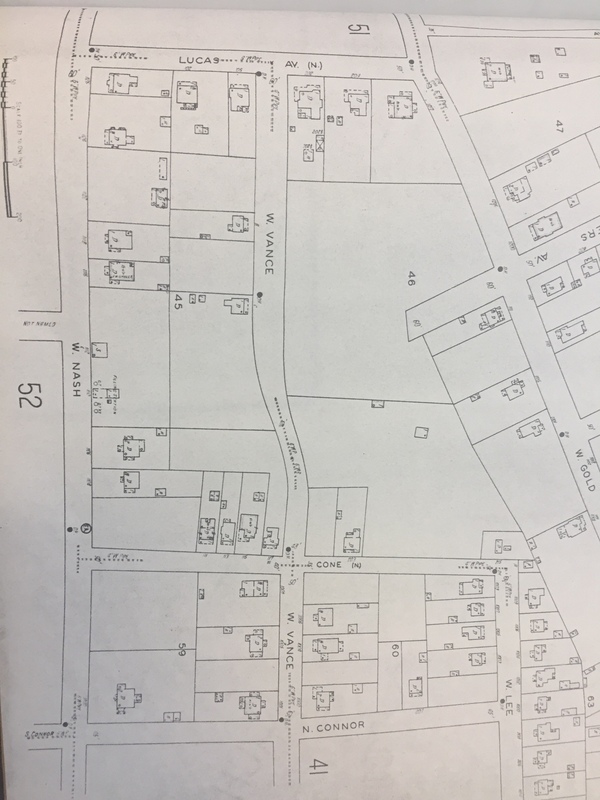 In the 1940 census of Wilson, Wilson County: at 302 Viola Street, owned and valued at $1800, widow Mollie Wilson, 66; fish market owner Dorphus Williams, 61, roomer; and father James Newsome, 86. Mollie Wilson died 30 January 1952 at Mercy Hospital. Per her death certificate, she was born 1 September 1875 in Wayne County to James Newsome and Penina Artis; was the widow of John A. Wilson; and resided at 301 North Vick. Informant was Irene Sherrod, 302 North Vick. The sixty-fifth in a series of posts highlighting buildings in East Wilson Historic District, a national historic district located in Wilson, North Carolina. As originally approved, the district encompasses 858 contributing buildings and two contributing structures in a historically African-American section of Wilson. (A significant number have since been lost.) The district was developed between about 1890 to 1940 and includes notable examples of Queen Anne, Bungalow/American Craftsman, and Shotgun-style architecture. It was listed on the National Register of Historic Places in 1988. In the 1925 Hill’s Wilson, N.C., city directory: Rutherford Geo lab h 1200 Queen. Also, Rutherford Maggie dom 1200 Queen. George Rutherford died 15 August 1932 at Mercy Hospital. Per his death certificate, he was born 15 March 1885 in Tennille, Georgia; was married to Maggie Rutherford; resided at 1200 Queen; and worked as a cook. 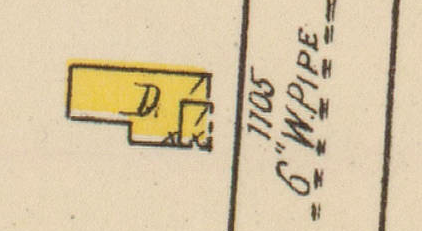 In the 1941 Hill’s Wilson, N.C., city directory: Farmer Geo (c; Mamie) chauf h 1200 Queen. Also, Farmer Geo jr. (c) shoe shiner h 1200 Queen. Photograph by Lisa Y. Henderson, April 2018. The Dardens secure their son’s start. 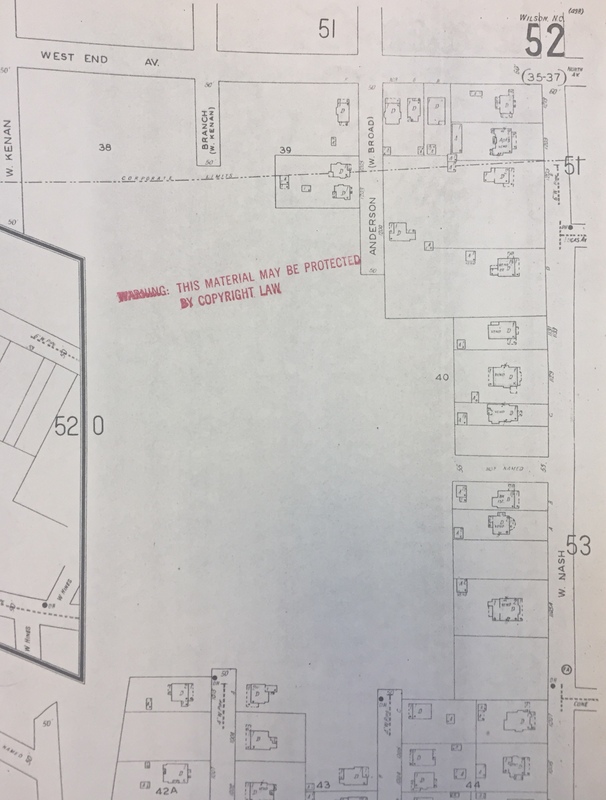 In March 1905, Charles H. and Diana Darden conveyed to their son Camillus L. Darden a one-quarter interest (with a life interest retained) in a lot on the south side of Nash Street “whereon is located the new shop and hall” in order to encourage his interest in a bicycle repair business. The elder Dardens also leased to C.L. Darden one-half of the first and second floors in the shop building. The lease was to continue year after year for five dollars per year as long as C.L. pursued his business. If C.L. ever wished to sell his interest in the property, his parents had right of first refusal to purchase it for $250. Deed book 72, page 49, Register of Deeds Office, Wilson. The demise of Grabneck, pt. 2. At the end of the 19th century and through World War II, Wilson’s tobacco barons and other wealthy businessmen and professionals lined blocks of Nash west of downtown with fine homes in a variety of architectural styles. 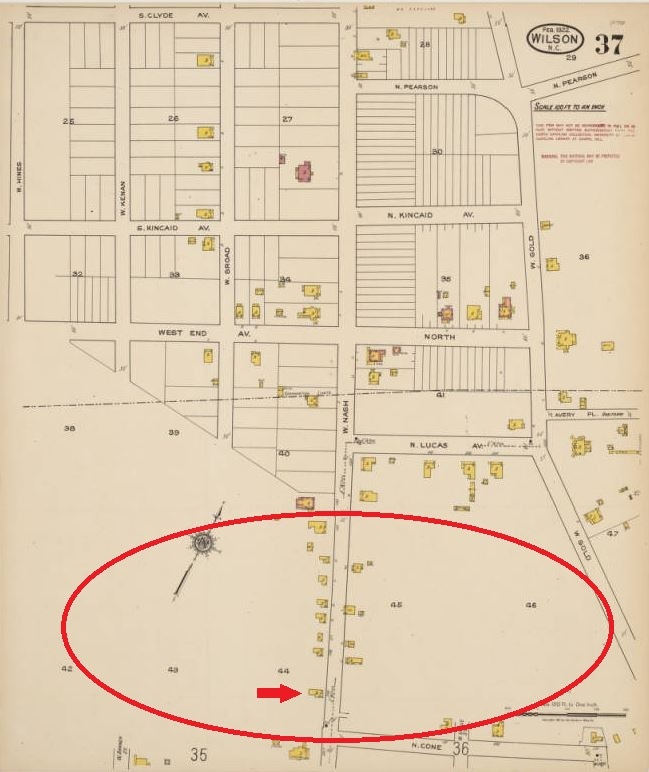 By 1920, several blocks away, just beyond city limits, developers laid out West End Park in a tidy grid of new streets, including West End, Kincaid and Clyde Avenues. Between these neighborhoods, like a foot wedged in a door, was a large uncharted expanse whose few tiny clapboard houses clustered in the 1100 block of Nash. Who owned this land? By and large, one family — the children and grandchildren of Daniel and Jane Best. It was the home of Wilson and Ada Best. In October 1925, they finally relented, accepting $4000 from H.W. and Margaret Abbitt for their 66 by 200-foot lot on Nash Street. The Abbitts quickly tore down the Bests’ little frame house, and in 1926 erected an impressive Colonial Revival residence. 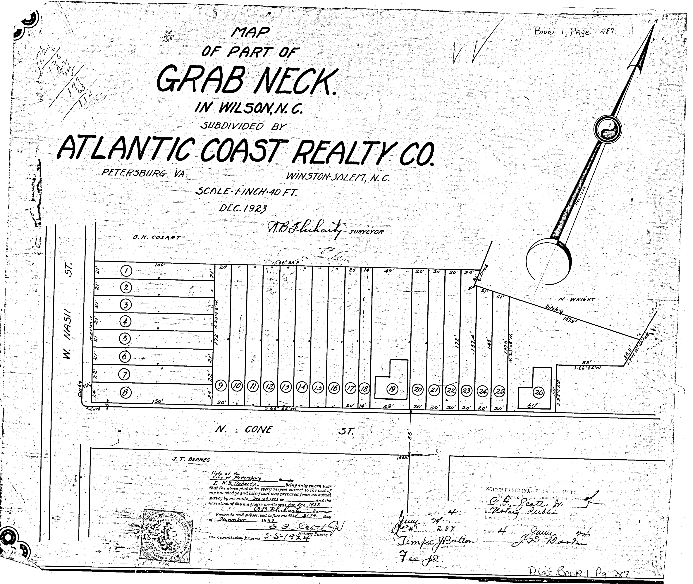 The 1930 Sanborn fire insurance map shows how quickly developers moved into the area vacated by the Bests. On the northeast side of West Nash Street, a sinuous extension of Vance Street was cut through, and houses sprang up along West Cone and West Gold. On the southeast side, all of the Bests’ houses were razed to make room for the muscular brick showplaces of white Wilson’s elite. The Abbitt house, 1105 West Nash Street.